The Chronicle today notes that over 400 people are missing in the aftermath of Hurricane Ike. The TV news break just said that the official death toll here in Texas is 29. It will certainly rise. Here in Southeast Texas sixteen days after the storm we still have a couple hundred thousand people without power. We have a couple hundred thousand without running water. Thousands, of course, have uninhabitable homes. When I look at the national news feeds, mainstream, blogosphere, alternative or print, I feel as if we are invisible. Three years ago, they said that Hurricane Rita was the “forgotten storm,” since Katrina’s overwhelming impact consumed so much attention. Today, with the financial crisis, the election, and the ever-faster spinning news cycle, we are a short-term wonder. I hope people saw us quickly. It seems like now we’ve disappeared. I’ve been thinking a lot lately about Post-Hurricane Stress. I see and hear it in myself, and in the voices and faces of people I talk with and people I see on TV. Everyone in Southeast Texas has some of this stress, to some degree or another. Each of us deals with it in proportion to the extent that Hurricane Ike disrupted our lives and the extent of our own coping skills and support network. I was curious enough about the phenomenon that I consulted Google, which quickly led me to tips offered by LSU that have been reprinted and quoted widely in Texas and Louisiana publications this month. – Be patient and establish what’s really important. Realize that everyone’s point of view on what is top priority may be different from yours. – Don’t expect things to return to normal immediately. Accept that changes in your life, both physically and emotionally, will be here for a while. – Recognize that hurricane victims have suffered losses and that it’s normal for them to express disbelief, anxiety, anger, sadness and depression. – Understand that the emotions of hurricane victims can swing dramatically, and moods could change without warning. – Don’t fail to notice your children’s feelings. They need to feel they can rely on you for the extra love, attention and support necessary to get through this disaster. Comfort them, making sure they realize they are not responsible for the problems you face. – Keep your family diet as nourishing as possible. – To build a sense of capability, focus on the big picture rather than little details and problems. – Talk with family, friends and clergy. A compassionate network is essential to your recovery. – Resist the temptation to revert to personal bad habits while under stress. In other words, take care of yourselves first. Look after your personal safety, comfort, and emotional and physical stability. If there is damage to your home or you have tangible, financial, or personal losses, there will be a time to deal with these. Forget the broken house for the moment. Forget the mold. Forget wondering when and how much the insurance or the government will provide, unless there are resources you need from them immediately for your own personal well-being. In that case, identify what you need from whom, and go get it. The essential first step is to strengthen yourself so that you can face the other challenges that await you. All else will follow from there. 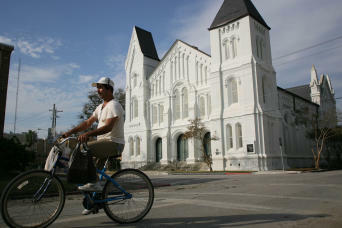 The Chronicle has an article this morning about the churches of Galveston. The main illustration is this photo of the First Presbyterian Church, which is a stone’s throw from where we used to live. Church Street does, in fact, have a number of churches either right on it or just a block or two away. The most notable is the 1848 St. Mary Cathedral Basilica, founded by priests from New Orleans. It actually resembles the Cinderella-castle architecture of St. Louis Cathedral in Jackson Square. I used to walk our dogs past it every day, making our way to the park at the courthouse square. I miss the church bells. I miss the birds in the morning and evening. I even miss the strange and colorful Island characters who wandered the streets. I know, I know it’s best that we moved here, the clean, safe subdivision close to the doctors and hospitals and all the things we need. Yes, the “things.” But still I miss what we left behind, almost surprisingly so. We were able to reconnect with our friends who lived across the street from us back there. A couple are now in Sugar Land, another is with friends in Houston. We’re lending our pickup truck tomorrow, when Island residents can go back again, so that they can take it home to retrieve some furniture and such to bring back to their temporary quarters. I wish we could do more. Today’s Chronicle goes into great detail on how a group of neighbors on Galveston’s Ball Street made it through Ike, and the aftermath. Ball Street was a couple blocks south of us, going toward Broadway. Unlike we were, these folks are closer to UTMB than to downtown. BOIs is the acronym, “Born on the Island.” It’s a great read, really capturing the spirit and character of the Island’s people. I read this sort of thing and feel homesick, although I know living in Pearland is best for us. Meanwhile, the Galveston County Daily News reports that the Mayor and leaders of the Port and the Hospital will be testifying in Washington to ask for recovery aid. It sounds like a lot — a billion here, five hundred million there — but it’s a pittance compared to what’s being proposed for our modern-day robber barons. …I felt suddenly protective of him, and of everyone on the island. They were riding a collective mania, I thought — high on having survived, on having a purpose. They seemed like their buildings: Fine on the outside. And yes, “The Spot” survived and is open. No bathroom, no food, no “gourmet hamburgers,” but lots of cold beer. As Galveston told its remaining residents on Monday to leave the Texas island devastated by Hurricane Ike, Robert’s Lafitte, a gay bar, was planning a pre-curfew drag show and Tina Turner sing-along. The first of two bars to reopen after Ike’s onslaught on Saturday, Robert’s Lafitte is a haven in the storm — for gays, straights, anyone who needs a place to drink and find comfort. The establishment, if it can be dignified by that word, is one of the oldest gay bars in Texas. Located in a unprepossessing brick building just up the street from the crippled Flagship Hotel, It’s know for the holiday events where Robert, the owner stages a drag “puppet show” Punch-and-Judy style with another performer. Both of them are gentlemen “of a certain age,” as we say of aging queens and divas. The show is first-time hilarious, second-time old, third-time a tradition. It is not to be missed. There’s a lot of colorful history with this bar. I had read that when Robert Durst was living as a fugitive on the Island, sometimes disguised as a deaf woman, he used to frequent the gay bars there. He smoked quite a lot — a kilo of marijuana was found in his freezer when he ran off from Galveston after the murder — and one time in the bar he set his wig on fire. I always pictured that happening at Robert’s Lafitte, maybe in the dark main room near the small stage, maybe on the back patio where assorted characters gather on lazy afternoons to pass around a cigarette of dubious repute. The regulars are a hard-living, hard-drinking, and, well, hardened crowd, but nonetheless warm and friendly, if you don’t mind them pickled. Typical of old-time Galveston’s sin-city ways, they’ve washed up from assorted origins, and they’re here to stay. They’re not the sort to evacuate, and not the sort to let a storm, however fierce, blow them away. Comcast came back overnight. The Internet and phone work again. A very nice man who speaks as much English as I do Spanish — slightly more than I realized, that is — is coming today to fix the fences. I am very tired and stressed. No bread on shelves. The bank is closed. They worry about financial crisis. We have a preview. But at least our house is intact and we have power. We are very lucky. I have fallen three days behind on reading the newspaper. Comcast confirms: ‘Network outage’ for Internet & phone. It was working since Tuesday. Earlier I quoted Ronnie Crocker explaining how the damage in the older part of Galveston has a certain “random” appearance. In truth, day to day life in the Greater Houston area has taken on an air of randomness. Take grocery shopping. The other day I was at Randalls and the milk, eggs, and bread were sold out but there was fresh meat. Many of the fruit bins were empty, but there were organic carrots. Another day HEB had whole milk and non-fat milk, but no 2% milk. So it goes. Today I arrived at HEB just after eight in the morning, just as a restocking crew was entering the front door. I didn’t know who they were at first. I thought maybe a busload of hungry people had come here together for some sort of mega shopping spree. By the way, the main entrance under the humongous sign is closed, allowing for better crowd and line control. The only entry now is through the other doors near the pharmacy. At this time of day there is no line. Entering the store, I wandered over to the eggs while the stocking crew rushed into the various grocery aisles. By the time I got to the laundry supplies, I realized who the people were and what they were doing. Faster than angry worker bees they were unpacking pallets and cases that had been prepositioned in the aisles. “Does anyone see Downy Wrinkle-Free?” one woman asked. They ran and darted to search and find the designated shelves for all their items. Clearly they were unfamiliar with the store. With a few “pardon me’s” and such I picked out my 3x concentrated All and my Snuggle and then gingerly navigated along. How odd to see all these quarter- to half-empty shelves fill up so rapidly before my eyes. Yet, the random omissions jumped out at me, forcing good-natured substitutions. No canned mushrooms. I’ll buy a couple jars. I wonder if they’ll have fresh ones in the produce deparatment? Nearly all the bread was gone, though the other day there were huge arrays of plastic crates of the simplest white and wheat bread in the main open aisles. Now you see it, now it’s gone, like a collective magic trick. The plain bread is not what I usually buy, but I’m more than happy to take it. If it’s there. The last few years we’ve been told over and over that we shouldn’t “settle.” What once were luxuries have became necessities that we deserve, the bigger house, the more glittery car, the cup of coffee with the more exotic sounding name. I just don’t care about that anymore, not that I did too much before. Yes, I did buy the free-range chicken. It’s not a status symbol, but more that I’d rather not eat a bird that grew up in a factory where it’s beak was cut off. But honestly, in a time like this, I’ll eat Tyson’s and be glad to have it. To their great credit, HEB provides any sort of chicken you could possibly desire, from factory-farmed to halal. But I digress. These are the days of randomness, and we learn to go with the flow. The store may be open. The store may be closed. The pumps may have gas. The pumps may be empty. The pumps may have gas but have no power. Or, they may have everything except someone who knows how to turn them back on. I may make it home from the post office in ten minutes. It may take an hour. So it goes, so it goes. I know there are reasons for why it happens. Physics and climate. Logistics. Human nature. So many things explain so many, many things. In a day like this, I can’t ask why. I only ask what, and what am I going to do next. So I finally got to clean out the refrigerator this afternoon. The freezer is basically empty except for the frozen water jugs I put in there in case the power goes out again. In the refrigerator, besides the milk, butter, and eggs that I bought in my mad dash to the store the other morning, all we have are staples and condiments that didn’t spoil. There’s only so much you can do with a box of cornstarch and a bottle of balsamic vinegar. What’s left in the pantry are pretty much rice, peanut butter, pasta, a few stray canned vegetables, some SPAM, oils, and assorted oddments like chocolate chips and shredded coconut. I feel like Old Mother Hubbard. My task tonight is to make a shopping list so that I can head out to the supermarket first thing in the morning. I have to get there early, before the lines get too long, before the things we need sell out. Mom talked about the bread lines they used to have back in the Great Depression, and how her mother used to feed the hobos who came to their door in Gulfport. Grandma Lucia was fortunate for someone running a household in those difficult years, in that she had a government widow’s pension. For so many, a reliable income was not something to take for granted, nor the means to buy food. I remember seeing photos of the Soviet stores, bare shelves and all, back during the Cold War. For a day or so immediately after Rita, I found the same thing in Galveston. Yet somehow I never quite envisioned planning life around how and when to get food supplies. This will pass, I know, soon. Another day, another normal, is just around the corner. On this day, those who have no power or no means line up at PODs for government supplies. PODs run out of provisions, and those waiting will stay or leave, wondering when the next trucks will come. We line up for gas, we line up at broken stoplights, we line up to stand in line. And those who can rush to stores seeking whatever they can find, before the next customer takes it, careful not to take more than a fair share, unless they’re taking extra for a neighbor or friend or even a stranger in need. But we are not strangers anymore, if we ever were. We are all neighbors now, and we have to rely on each other more than ever. Yes, that’s Dorothy’s line. but it’s being repeated by thousands of displaced Coastal residents these days. I’m catching up this morning on yesterday’s newspaper, and I found an essay with that title written by Ronnie Crocker. Take time to read it. He explains the heart of what Galveston is about and why Island residents so desperately want to get back. The farther in you drive, the damage seems more random, like tornado random. It’s bad, just not Lower 9th Ward bad. Things look fixable. It’ll just take a while. He goes on in great detail to relate the story of the family of what I think must be his mother-in-law, octogenarian Dorothy Davison. Yes, Dorothy. Her mother was a baby who survived the the Great Storm of 1900, as did their house on Avenue P. After Ike, that house still stands proud and resilient. I won’t recount all his other details; he’s already told the story, in words much better than mine. The thing to remember is that this old city, the one that survived the storms of 1900 and 1915, Carla and Alicia and more, has survived Ike. Galveston will take awhile to recover, and it will not be the same. The post 1900 Galveston was, even after recovery, a shadow of her former self in many ways. Still, she cleaned herself up, picked up her tattered dress, and carried on. She will do so again, reinventing herself once more.